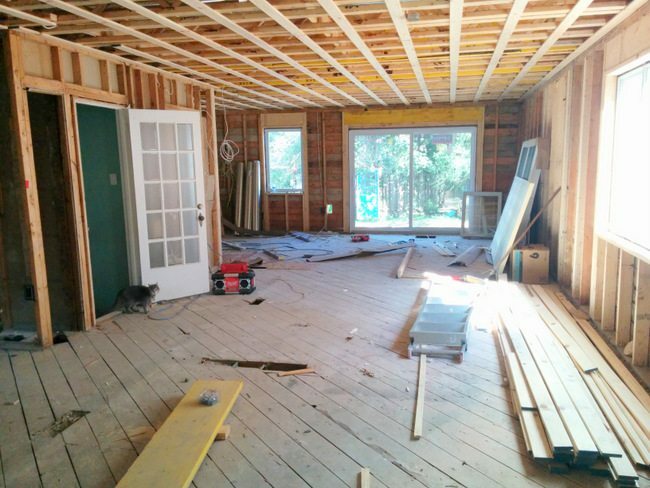 When we decided to build up on our bungalow, it made sense to take down all the walls in the main floor to get an open concept living space. We didn’t need the bedrooms down there anymore since we would have plenty upstairs, and we didn’t want it to feel pokey or like it had been added on to. 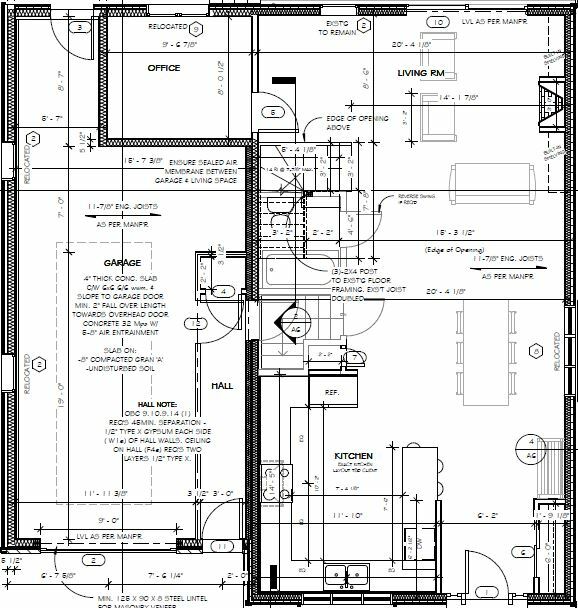 And here it is on our design drawings. Way more profesh. It looks a lot more square now, thanks to the garage added onto the left side. 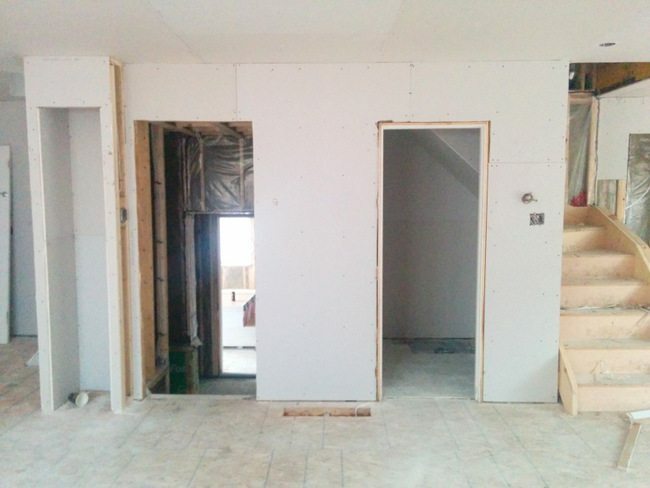 As you have seen, the kitchen stayed in the same spot but we moved the front door over to get more of an entryway area. What had been the living/dining room in the old house, is now our dining area. Down the road, we would like to have a bigger table in that space — something that would seat 8 or 10 people. And obviously once we have curtains, a rug, and other decor, it will help define that space better. Right now it’s a little bit like a table floating in the middle of the house, covered in reno junk. Across from the dining area is the side wall that used to be part of our hallway. It houses the side entrance (that leads to the basement and the garage), our main floor bathroom, and a new broom closet on the left. This photo was taken a while ago (pre-door hanging), but you get the idea. 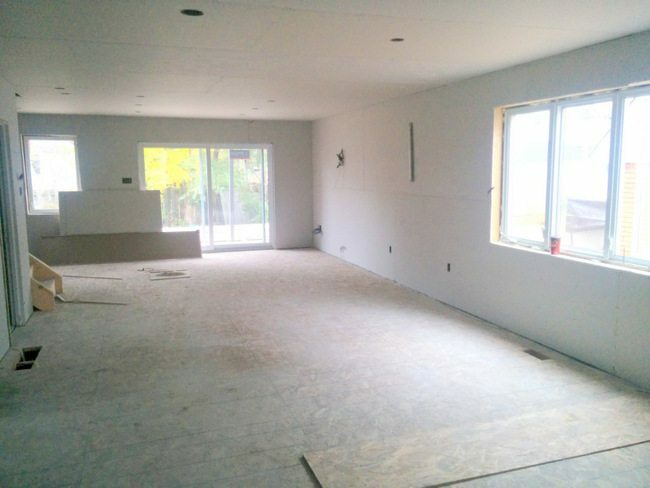 Then moving down into the back of the house, in what was our master bedroom, we now have the new living room. We put in a patio door – the biggest we could afford – to help maximise the connectedness to the backyard. We would have loved an accordion style door that opens right up in the summertime, but those cost some serious dolla dolla bills. Having this door to the backyard is a huge game-changer for our house, as you used to have to exit through the side door and then walk around to the backyard. There was no patio or deck back there, so we really didn’t make enough use of the space. Now with this doorway leading out onto a deck (we will be building that in the spring), we hope to spend way more time outside. We pushed out from where Maya’s nursery (slash office) had been and moved it over into the new attached garage. That space will eventually become our home office (right now it is acting as a put-the-junk-in-there-and-close-the-door kind of space). The new staircase is in the spot where we used to have a linen closet and partly into where Maya’s room used to be. We looked at having the staircase in other spots so that our living room could be a bit more open, but none of them quite worked or made as much sense. 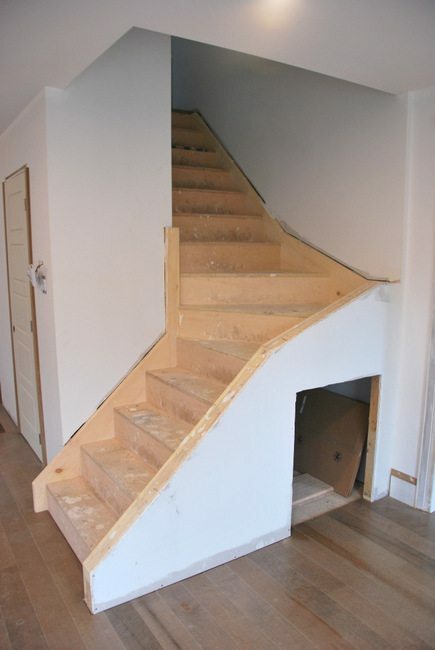 Staircases take up a surprising amount of room. It means that we have this nook at the back of the living room, which we will utilize as a little play space. We’re making a mini door under the stairs to hold toys. Maybe eventually make it a little secret hiding space? Wouldn’t that be fun? And then let’s turn around again to that living room. 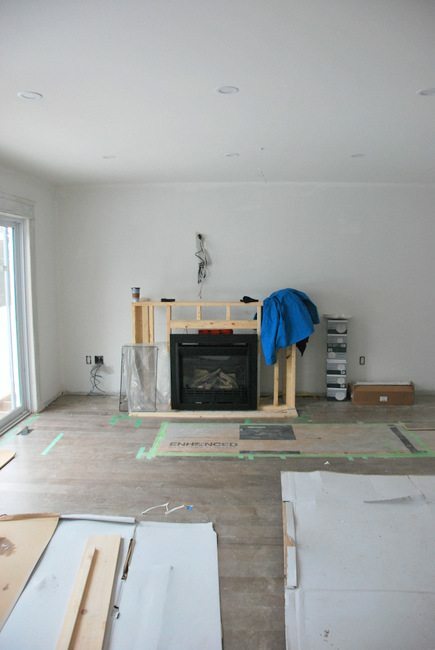 We REALLY wanted a gas fireplace in the house, both for the cozy factor and to help with heating, so we worked that in to our plans from the very beginning. We had it installed by a local fireplace company, and then I drew up some plans for built-in shelving around it. Now that this has all happened, it’s crazy to stand on the main floor and think that this space had been our entire house. Although it did feel as though it was getting small for us, it had clearly been really well designed and made such efficient use of the space. I’ll be back later in the week to give you an update on the fireplace built ins. They are really coming together and I’m in loooove. Hope you guys had a good weekend! It was “family day” here yesterday in Ontario. Dan didn’t get it off work sadly, but I had a chance to hunker down for the day with Maya. We are over some serious cold/flu viruses we had been battling, so it was nice to relax and play together. I’m totally ready for winter to be over though. This deep freeze we have been in is depressing. Come on, spring! oh this is SO exciting!! It all looks amazing so far! 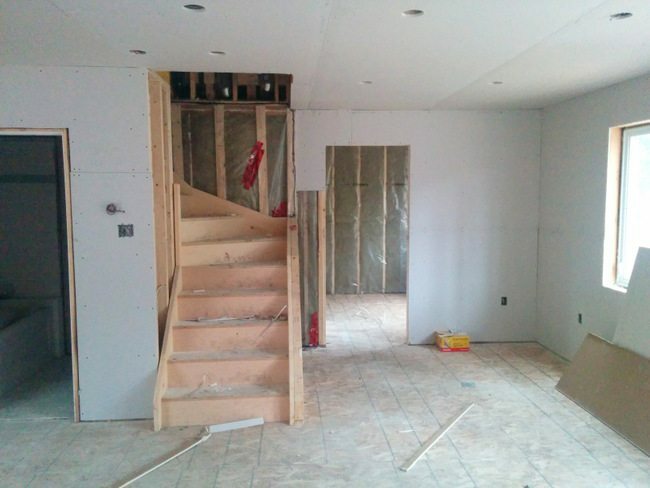 that little stair nook is going to be SO adorable for Maya!! Right?! I totally want to make that like a secret little spot for her. Wow! 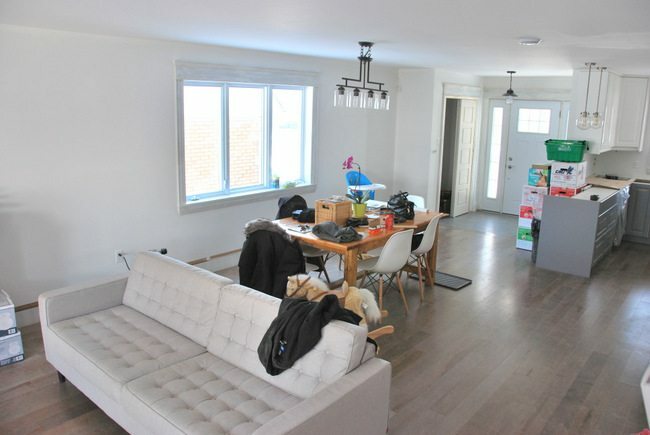 I can hardly believe this is the same house – it’s so open! Love the layout you chose, especially little nook for Maya – so cute! Thanks Amanda! Yeah it’s quite the transformation. It feels amazing so have so much open space now.